The machines are all around us, taking the world by storm–transforming consumers and businesses alike in truly transformative ways. And, there’s no escaping the buzz on disruptive technologies like artificial intelligence (AI), cognitive intelligence, robotic process automation and chatbots that are finally coming into their own. In fact, a recent IDC report projected spending worth USD 57.6 bn globally by 2021 on AI and cognitive intelligence systems across industries. Banking and Financial Services (BFS) is expected to take the lead, accounting for a quarter of the global investment, the study estimates. The BFS industry’s 2017 spend on this front is pegged at USD 1.72 bn, as per IDC. But why is the industry so excited about AI, machine learning and other cognitive technologies? Well, given that retail banks and other financial institutions deal with massive volumes of ever expanding data, the new wave of intelligent technologies provide unexplored business opportunities. Firms could potentially tap into their internal resources to improve bottom line, enhance customer experience, and ensure regulatory compliance, amongst other business benefits. Furthermore, customers are now demanding hyper personalization with regard to the products and services they are offered. A recent study revealed that 67% of bank customers were open to sharing to personal data, but in return 63% expected services, such as personalized advice, monetary rewards and faster loan processing. And, these are precisely the areas AI could help the finance industry unlock significant business value around. Firstly, technologies like machine learning, natural language processing and robotics processing automation help enterprises gain deep domain knowledge, and automate routine workflows. Secondly, companies drive customer engagement by leveraging unstructured data, and customizing offerings with cognitive interaction tools. Moreover, organizations can derive actionable cognitive insights by analyzing varied data points from multiple sources. BFS organizations have been looking to expand investments in intelligent technologies, having identified several opportunities that would aid business growth. A recent study indicated that 78% of bankers were convinced that AI would enable advanced user interfaces that can augment customer service, and 79% expect AI is likely to transform the way banks gather data and become the central platform for customer service. By automating the front line, exploring virtual assistants and back-office robotic processes, companies are aiming at realizing higher savings and lowering risks through decentralized customer interactions. Moreover, AI-driven insights around consumer purchase patterns could enable improved decision making for enhanced customer experience, while the use of interactive technologies such as chatbots are already boosting customer engagement. Beyond customer-focused applications, intelligent technology can also support financial institutions in other functions, including real-time fraud detection, and regulatory compliance via continuous data monitoring. Personalized robotic advisory: A leading Canadian bank recently introduced a cognitive banking application containing a suite of engaging features. One such feature provides insights that help bank offer timely and customized advisory service to clients, and assist them in efficient money management. It can provide insights on spending habits, send reminders based on purchase history, etc. The bank also rolled out an automated savings feature through its mobile app. Based on historical transactions, the bank can estimate monthly expenditure from the checking account, and transfer the balance to the savings account to maximize customer savings. Similarly, a Dutch bank has unveiled an app that leverages machine learning to categorize expenses and income, allowing users to set a budget and get alerts in case they are overshooting the limit. AI-driven accurate forecasting: Some US hedge funds have employed artificial intelligence algorithms to efficiently forecast the future course of the stock market and enable informed decision making. This approach is designed to reduce errors resulting from human fallacies and inconsistencies. Chatbots for improved user experience: Bank of America’s chatbot ‘Erica’ assumes the role of a digital assistant. Customers can instruct Erica to implement the required banking operation, without the need for navigating the mobile app or website. The chatbot is also equipped to analyze spending patterns and make suggestions on saving. Robotic process automation for efficient operations: JP Morgan employs Contract IntelligenceCOIN – robotic automation that facilitates faster commercial loan processing, with accurate document reviews completed in seconds. In addition to providing customer satisfaction with quicker processing, the efficiency saves the bank money and human resources. Fraud detection to minimize risk: Rather than employ fixed norms to apply across the customer base, credit card company Mastercard implemented Decision Intelligence Technology that continuously studies spending patterns and establishes a personalized baseline to assess transaction for potential fraud. Financial enterprises are still exploring intelligent technologies, finding new opportunities to understand customers, and deliver products and services that meet customer expectation. With machine learning, the technology has the capacity to self-learn and continuously improve its offering. Ryan Hobbs is Head of Infrastructure and Support Services responsible for digital transformation and ensuring our client’s problems are solved and opportunities realized. Ryan is a thoughtful leader who enjoys the intellectual challenge of finding a winning strategy and the satisfaction of making a difference with deep knowledge in technology and business principals including presales, service management, SaaS delivery models, robotics, service delivery and infrastructure services. 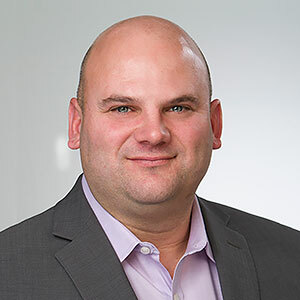 Ryan has spent 17 years in the Fintech industry servicing financial institutions globally, with a focus on operational excellence, outsourcing, globalization, post-merger integration, divestitures, and data center optimization.